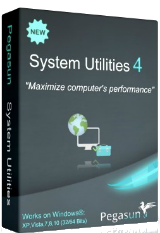 Pegasun System Utilities Premiere 4.70 was available as a giveaway on May 26, 2018! The complete award winning care package for your PC! This program will clean up, speed up, maintain, secure, and repair your system to make your PC run like brand new. Provides more than 26+ reliable tools that are designed to help you with any PC maintenance needs. Completely speed up, secure, and repair your PC in 1 click. Significantly improve laptop battery life and resources. STOP Windows 10 spying with Privacy Guardian. Reduce lag when playing games. Load games much quicker and smoother. Thoroughly clean and optimize your computer by removing all the accumulated junk files. Please note: the best 3 comments with detailed product feedback will be rewarded with a full-featured lifetime license (including updates and tech support). Hi, Can anybody help with this situation, unfortunately I am not a pc geek and have VERY VERY limited knowledge of how this stuff all works. I press the switch and if it dont work its 'phone a friend', I know that's really sad but that's the way it is. 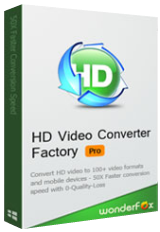 I downloaded and installed this software during the GOTD time period during which it was FREE, brilliant GOTD keep it up, I was advised that the program was installed and fully registered and activated, so I ran the 1 click clean up...excellent. I then went through the individual sections and used the program as required until all was running all 'tickety boo'. When I next switched on my laptop I was advised that W10 was going to 'install the downloaded updates', this would need a restart..do you want to restart now? I selected ''restart now'' and got the reminder.. your pc is restarting and installing updates do not turn off. I left the laptop 'doing its thing' and then when it had finished all that appeared was a black screen with a moving circle near the bottom of the screen, this went on for ages, so I left it overnight thinking that it may be a large update. Next morning still the same screen with the moving circle, time to 'phone a friend'. He advised that there was probably one of Microsoft's well known 'issues' with their updates which was stopping my laptop 'rebooting'. No.2.. I turn the laptop off and then on restart rapidly press some keys to get to the 'Repair and Restore' options. I did this and then selected the 'repair start up option', this did NOT work..return to 'Repair and Restore Options' and select 'Restore to a Previous Point' where your system was working. I selected the relevant 'Restore Date and Time' from the given options and 'Hey Presto' after around 5-10 minutes my laptop restarted as normal. However the desktop Icon for the previously installed Pegasun System Utilities was NO longer on my 'desktop screen'. I went back to the original 'download' and did a 'program search', a message 'popped up' to say that 'this program is not installed, please find the .exe file and run this to install this program on to your system. I am now completely confused, I have already installed the software, in plenty of time, received confirmation that the program has been registered and 'activated' and is fully working and have actually ''used'' the program. PLEASE PLEASE HELP, as I do NOT want to uninstall what I thought was a REALLY REALLY GOOD piece of software, especially for a PC 'numpty' like me, '1 Click' and it is ALL done for you, Brilliant..except now I cant use it, so annoying. Why do Microsoft release their so called ''UPDATES'', which if you do NOT download and install keep giving you those very annoying 'pop ups' advising that you need to ''restart you computer..do you want to restart now.. and if you miss the 'pop up' and it 'times out' off goes the update and does the 'install and restart' completely on its own, even though I have the 'DO NOT automatically download and install button selected, BEFORE the 'updates' have been checked as 100% PERFECT and RUNNING WITHOUT ANY ISSUES OR BUGS. If I did not have a good friend that does not mind me phoning up or dropping my laptop off to him and leaving it with him until he can get round to having a look, it would be costing me far more than my old Dell Inspiron 9400 is worth, to get it ''sorted',' each time Microsoft release an ''unready update'', which would leave me without any way of using the internet. No. 1.. anyone out there that can help me get back access to the Pegasun software. No. 2.. advise how I 'install' the latest updates without it causing the same problems so that I have to go back to the ''RESTORE'' option to get use of my laptop. Please Please keep any instructions to a very BASIC set of operations as I really am a PC numpty. Just what I needed, in a compact, user-friendly package. This has speeded up my laptop. THANKS! Verified on WIN 10 and WIN 7 Professional - in both cases the utulity performs very well improving overall speed and comfort. CONGRATULATIONS to Pegasun. My experience with other, similar utilities and conclusions are exactly the same as given under #35. Additionally verified on 2 separate computers with WIN XP Home edition - on both the same problems with some features - most painful is Turbo mode which can not be activated. 1-click optimization lags on Service maintenance. It is possible to go through this process after activating it from Tools menue however it takes ages... Seems like this utility is not a good option for WIN XP. Installed this program, went through the tutorial set the parameters for cleaning and boosting, restarted p.c. and was amazed with the outcome of startup and general operation of p.c. all my apps started up quickly and ran smoothly, even ran 5 apps at same time and memory usage stayed low which I had a problem with before . Thanx for this program, it will stay on my laptop as long as I have it. Love Pegasun System Utilities!! Pegasun System Utilities Premiere 4.70 hält tatsächlich was es vespricht sehr gute Software kann ich nur empfehlen. in optimal conditions at all times. The interface is straightforward and easy to use. I did the cleaning and defrag for my computer, it really has sped up my processing and everything goes well. In conclusion, when used properly, it can help you take charge of your computer and optimize its running, enabling you to minimize the occurrence of system lags or other similar problems. Thanks for the Giveaway! Pegasun System Utilities is a comprehensive piece of software which provides you with complete care package to help you clean your computer of unnecessary data like web history, defragment drives, enhance its overall responsiveness/speed and repair your system to make your computer run like brand new. 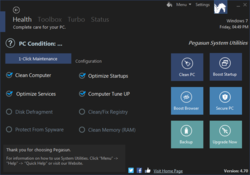 With it, you can use "Clean PC," "Boost Startup," "Boost Browser" or "Secure PC" to take care of your computer so that it can run in optimal conditions at all times. The interface is straightforward and easy to use. I did the cleaning and defrag for my computer, it really has sped up my processing and everything goes well. In conclusion, when used properly, it can help you take charge of your computer and optimize its running, enabling you to minimize the occurrence of system lags or other similar problems. How do I know it is activated? Das Programm musste ich mir woanders downloaden,da ich es mit der SETUP.exe Datei nicht installieren kann.Ansonsten kann ich diese tolle Software dringend jedem User empfehlen.Sie macht das,was sie verspricht.Ist nur sehr schade,dass ich es nicht aktivieren kann,komme mit der GCD-Setup Datei einfach nicht klar. Win 10. Had to disable avg to install but no problems noted. Ran said my computer was in bad shape :) Ran 1 click and optimized. Restart was required for full effect. Held my breath and crossed my fingers.. Reboot was uneventful but successful. Re ran proggie and 1 click again and i'm at 100% PC condition excellent. YEA. Looking around I wanted to try the turbo mode for gaming and it may well work but was scared during set up. Not a 1 click solution here. Way to complicated for a self admitted idiot this late. But I will definitely try again tomorrow. Will keep the program and give it a go. Will it make it past 30 days a good chance. Program does need to support power management mode ultimate performance. Karl if your reading this come back, you the best!! Win 10. Had to disable avg to install but no problems noted. Ran said my computer was in bad shape :) Ran 1 click and optimized. Restart was required for full effect. Held my breath and crossed my fingers.. Reboot was uneventful but successful. Re ran proggie and 1 click again and i'm at 100% PC condition excellent. YEA. Looking around I wanted to try the turbo mode for gaming and it may well work but was scared during set up. Not a 1 click solution here. Way to complicated for a self admitted idiot this late. But I will definitely try again tomorrow. Will keep the program and give it a go. Will it make it past 30 days a good chance. Program does need to support power management mode ultimate performance. Thanks GOTD & Pegasun Karl if your reading this come back, you the best!! Hey there and first of all thanks a ton for providing this utility laden software as a freeware. Right from the Tutorial provided in the beginning everything is very simple to use yet very effective. It has several features that i did not even know before i started using this like Browser Booster and especially the game booster. ! click and your PC is tuned to simply outperform itself. The Toolbox has a multitude of features that are really effective and help in fixing various rare issue i would have otherwise strugggled with. Thanks to Pegasun for creating such a great piece of tune up utility which is light on the pocket yet very effective. Uninstalled Advanced System Care after using this software as it had screwed with my PC. 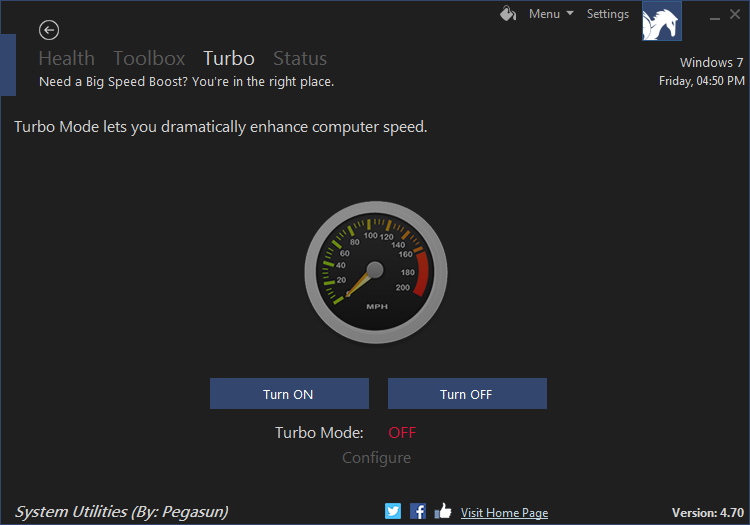 The best and the most useful feature for me is the Turbo Bosst feature for my gaming and other memory intense applications. Prakhar, you sound like a company man! I mean, for example, you have never heard of a game booster? SERIOUSLY? Give me a break! Kiwi1960, Hahaha no no i'm a student and sorry if i'm not familiar to these terms. i just got a laptop for myself few months ago so sorry if i'm not a professional cus i'm still getting used to stuff. BTW i've started to use softwares from this site as i just knew some basic softwares like ccleaner and IDM. I hadn’t heard of Pegasun System Utilities until today. The reviews had about 75% Positive so I thought I would give it a try even though I have following Utilities software: Advance System Care 11; Glary Utilities 4.7; Wise Care 365 v 2.96; Kerish Doctor 2018; Win Utilities Pro 11.1. No problems with installation just remember to disable antivirus software like Avast before installation. I tested the software on two laptops both HP with Windows 8. I ran the software after having my system up for about 5 hours. I noticed a good improvement on response time on existing websites and new websites. My other labtop: HP with AMD E2-1800 1.7GHz 4GB Ram 64bit. This laptop has always been a lot slower. Always took several minutes to open a few web pages even though I had used several software utilities to improve its performance. After running the Pegasun and rebooting I noted a big improvement in loading of web pages. Advance System Care 11 Pro’s has a nice mini Ram and CPU Display and other features. cons uses a lot of resources and parent company sends out a lot of request to buy their products. Wise Care 365 : I s a little better than Glary both are decent software. Kerish Doctor and Win Utilities are also good but If I need to pick only one right now it would be Pegasun. Bummer, if it "does something" (deletes) before I know WHAT........that's no my cup of tea. I think this software is great. It's easy to use and understand even for a beginner. It cleans well and safe I also like the tuneup and defrag. The defrag works much better then the windows one for me. The 1 click maintenance is a very safe way for older people that don't have a clue about computers to use and is quick and handy.I also find the turbo help me with making my games a smoother play and more enjoyable. The different themes add a nice touch ( just a personal thing) to the software. How does one stop this cleaner from deleting cookies and log in information? I couldn't find the setting, but ran the program anyway. And now all my cookies and login info is gone. Injeun, Well if the developer can't answer my question, and there is no way to prevent their product from deleting cookies and log-in information, I may as well uninstall it. Thanks anyway, and good luck to the developer. Injeun, Is that so bad that cookies are gone? I do not want them. It is only those who offer cookies that take advantage (money), not the PC user. Did you tried to remove the internet connection, the adapter. Windows will install it automatic and also connect to the WiFi-point. And then you can test the internet connection. Allen, "every possible fix" Did you tried to remove the internet connection, the adapter. Windows will install it automatic and also connect to the WiFi-point. And then you can test the internet connection. Ootje -- Yes I tried all of those fixes. Uninstalled the wireless device, reinstalled device drivers, several reboots, etc. I used NETSH to reset the IP's. Multiple attempts and fixes -- nothing worked until I uninstalled your program. Then, my wireless came back to life. Does your program somehow capture my internet traffic? Ootje is not the software manufacturer. He is a helpful and knowledgeable user of this site. Your specific question needs to be addressed by the software manufacturer who seems to be absent!!! Allen, Ootje is not the software manufacturer. He is a helpful and knowledgeable user of this site. Your specific question needs to be addressed by the software manufacturer who seems to be absent!!! Susan, But it does not always offer a solution to problems caused by some given away programs. Downloaded zip and activated etc but where is it on my PC? "If you immediately get a "Successfully activated" message and the installation does not start, you may need to disable your AV protection temporarily, or mark the installation file as an exception for your anti-virus suite". It could be some other reason, but try to start with the above tip first. Would be nice to paste picture or word document in these comments to provide all details. Error noted system.nullreferenceexception: Object reference not set to an instance of an object. at StartupManager.Main.O.O. (String ) Would be nice to paste picture or word document in these comments to provide all details. Installed - it says successful - but where is it? I can't find the program anywhere my computer. It installed, but to where? I am guessing you are seeing the dialog that pops up after the install. That window is not an indication that the program installed properly. Also, without knowing you OS version, I cannot say where the program installs to, but for my Win7 Pro x64 OS, the program installed in C:\Program Files (x86)\Pegasun\SystemUtilities. IF there is no program at that location, the program may have been blocked from installing on your system. Make sure you extracted all of the files in the zip download file to a standard Windows folder. Then run the setup from that set of the files. If you attempt to run from within the Zip download, the program does not install properly. Steve, I am guessing you are seeing the dialog that pops up after the install. That window is not an indication that the program installed properly. Also, without knowing you OS version, I cannot say where the program installs to, but for my Win7 Pro x64 OS, the program installed in C:\Program Files (x86)\Pegasun\SystemUtilities. IF there is no program at that location, the program may have been blocked from installing on your system. Make sure you extracted all of the files in the zip download file to a standard Windows folder. Then run the setup from that set of the files. If you attempt to run from within the Zip download, the program does not install properly. Gary, that is true with what you write, but if the setup is done from the ZIP, Windows will say that the ZIP file has to be unpacked if the setup is to continue working. If there is only an exe in the ZIP file, there is no need to extract the file, Windows will do that for you, regardless of what is said to extract the ZIP. Pegasus system Utilities Premiere is a great program and with its tasks of fully configuring, speeding up, cleaning, restoring and ensuring the security of the computer system is tested in full. - Add a module to manually create and delete system restore checkpoints. - To include in the program the function of uninstalling unnecessary programs and their traces in the registry. - Add tray icon to display disk temperature. - Add a feature to check installed software for new versions to update, as well as checking the status of drivers and updating outdated. Pegasus system Utilities Premiere is a great program and with its tasks of fully configuring, speeding up, cleaning, restoring and ensuring the security of the computer system is tested in full. My wishes for further development of the program: - Add a module to manually create and delete system restore checkpoints. - To include in the program the function of uninstalling unnecessary programs and their traces in the registry. - Add tray icon to display disk temperature. - Add a feature to check installed software for new versions to update, as well as checking the status of drivers and updating outdated. After running Pegasun on my Win10 64bit desktop here are the details: CPU% 0.04%, so it's not a CPU hog, memory (private bytes) 38,688k and memory (private working set) 4,852k, so overall not large resource consumption. As a frame of reference SysMain uses ~119,000k and ~126,000k respectively. I have several programs that monitor and protect my PC so didn't active the "Spyware Defender" option. I do like the aspect the program provides to allow you to select which program options the user can activate. I also greatly appreciated the fact I didn't need to jump through hoops to activate the program. This is one of the very few that automatically activated itself without any additional steps. If I have time later today after the program has run for several hours, I will attempt to update my comments to provide some feedback as to the actual improvements, if any, the program provided. This was just my first observation to provide input as quickly as possible. Hope this helps. Janes2, if the machine has a drive activity light, it never, ever stops flashing. That's because the Win 10 spyware logs EVERYTHING and does a scheduled dump of all your information back to Microsoft's servers. And then there's that secret pact between Microsoft and Intel where only Win10 will run on Intel's newest processors. You can get Win7 to run, but if it ever goes online to check for security updates, the machine crashes every time. Janes2, if the machine has a drive activity light, it never, ever stops flashing. That's because the Win 10 spyware logs EVERYTHING and does a scheduled dump of all your information back to Microsoft's servers. And then there's that secret pact between Microsoft and Intel where only Win10 will run on Intel's newest processors. You can get Win7 to run, but if it ever goes online to check for security updates, the machine crashes every time. Janes2, You can always unplug your device from the internet, or unplug your router for that matter and take it offline when you aren't active. Even better is to not use Windows 10. And if you are using Windows 7 just delete/disable Windows Live & TrustedInstaller. Kenneth Smith, that would not work on a server or a network and by the way, win 10 updates when ever it detects you are browsing the internet and many times you are just idle. I have nagging screen to update or win 10 will shut down the whole computer. olrowdy01, OK, lets do that, now, how on earth you will run software written for 64bits and win 10 only. Found that out when MS-!0 his the fan.......went back to XP........if I ever change it will be to "you know who"
It installed fine, and runs very quickly. A couple of problems encountered. It somehow disabled my camera that I use to sign on to Windows, and erased the PIN alternative method. Had to remember what my Outlook password was to get on. Be advised that when you allow it to clean your computer, it will erase the cookies that you want, along with a lot of the sign on credentials. I spent about 30 minutes going to each banking site to re-enter my user name, which varies from site to site. Overall, it seems to be a good program. Thanks GOTD and Pegasun. Regarding your Windows update: I had a similar problem on an older tablet (32GB fixed/limited memory) and resolved it by plugging in a 32GB SD memory card with lots of available free space (showed as drive E:) and then chose it for the updater to use for its temporary download files. A USB port thumbdrive/"memory stick" might also work. After the updated Windows proved to work OK, when offered I allowed the system to delete the old version of Windows to free up much-needed space. Jim DeMian, Regarding your Windows update: I had a similar problem on an older tablet (32GB fixed/limited memory) and resolved it by plugging in a 32GB SD memory card with lots of available free space (showed as drive E:) and then chose it for the updater to use for its temporary download files. A USB port thumbdrive/"memory stick" might also work. After the updated Windows proved to work OK, when offered I allowed the system to delete the old version of Windows to free up much-needed space. HMarx, Wow, thank you. I put in the SD memory card (64GB), but the updater apparently did not care about the extra space. How do I tell the updater to use that space for its temporary files? Is there a setting somewhere? Sorry to take your time. I'm often sceptical when seeing a new cleaning/maintenance product. But after giving this one a try, I am quite impressed with it's range of features and the ability to fully check, analyse and control what actions are taken, even though there is 1 click style maintenance options too. It's nicely designed and on the whole, well thought out, which indicates that whilst there are a few unnecessary bells and whistles, this has been designed and tested by techies that know what to look for and where. I would never recommend one click options as they can be too dangerous for their own good but if you spend a little time exploring each option then you will find the features having some reward. I'm often sceptical when seeing a new cleaning/maintenance product. But after giving this one a try, I am quite impressed with it's range of features and the ability to fully check, analyse and control what actions are taken, even though there is 1 click style maintenance options too. It's nicely designed and on the whole, well thought out, which indicates that whilst there are a few unnecessary bells and whistles, this has been designed and tested by techies that know what to look for and where. I would never recommend one click options as they can be too dangerous for their own good but if you spend a little time exploring each option then you will find the features having some reward. A keeper. Thank you for the opportunity Pegasun & GOTD! I am reluctant to do any cleaning with this software because I see a few issues right after running Analyze as recommended in the opening tutorial. First off, I am running Windows 10 64 bit latest update is 1803 version. 16 GB's, 3.6 GHZ i7 PC. 1st - I was hoping this would be a replacement to using CCleaner and other types of cleaners for clearing out cookies, while it does clear out cookies, there is no easy way to "White list" the cookies that you want to keep. I do realize you can right click over in my case Google Chrome in the scan results section to see the list of files and uncheck what you want to exclude, but there is no clear definition as to what cookie is what, only numbers for identification making it impossible to white list the ones you want to keep. So it is delete all or nothing. An improvement would be a better cookie clarification to allow an easier way to exclude the ones you want to keep. 2nd - I use One Drive all the time, I ran analyze and opened the startup manager after doing so and it recommended to disable One Drive and classified it as "Useless". The thing is, it is not useless for me, I use it all the time, in fact it is essential for my uses. The problem is, it should be made more clear as to how to "White List" startup items. Most people when the startup item is unchecked and listed as recommended to disable will re-check the item and select "Apply" thinking that it will exclude the item or items, but it does not. You have to "Right Click" and select "Ignore" for each item that is set to be disabled to exclude them. This is very confusing and I hope the author changes this in future versions to avoid this confusion. 3rd - As mentioned previously, the point of having check boxes is to not have to right click. I think there should be a better design to where everything is right there in front of you instead of having to right click. The check option also having the right click extra options for certain items makes things very confusing and most certainly will result if you aren't careful in disabling or deleting something you do not wish to do so to while leaving you thinking that it is excluded. 4th - I really like the Tune Up section of the software, it is very straight forward and has some useful tune ups. Only issue for me is, I think it would be better left in the toolbox section and ran on a "Per needed Basis" rather than having it in one click maintenance. The reason why is I could find no way to exclude some tune ups that I wish to not use "If it is ran using the one click maintenance method". I realize you can unclick it in the one maintenance settings, and you can also select "Default" if you accidentally disable something or uncheck it etc... It could cause an issue if you forget or are unaware that you just ran something you did not mean to. Otherwise, some very nice tweaks in there. 5th - The Spyware Defender section appears to be very good, and also has an easy to exclude section with explanation on how to do so. I really like this, very good! 6th - Registry Cleaning section - While I generally try and avoid registry cleaners, this looks very nice and tells you what you are about to remove, it's easy to exclude items by right clicking, but there again, if you uncheck something it leaves the user with the impression that it will be white listed when it is not, so unless you specifically right click and exclude something, unchecking it will not protect it next time you run registry cleaning, you have to right click to exclude. One last suggestion, it would be a nice addition if the author were to add the option to create shortcuts on your desktop to each item in the toolbox individually for those who just wish to use specific parts of the software. Overall, I am impressed with all the available options and tools, don't get me wrong, I am not complaining, I am giving my review to hopefully help the author better improve the software. I must ask though, since this is not a lifetime license and you get "No updates" per the read me file in the download file, I am assuming you can use it forever so long as you don't update it? Or does it revert to the free version after a period of time? Thank you for the opportunity Pegasun & GOTD! I am reluctant to do any cleaning with this software because I see a few issues right after running Analyze as recommended in the opening tutorial. First off, I am running Windows 10 64 bit latest update is 1803 version. 16 GB's, 3.6 GHZ i7 PC. 1st - I was hoping this would be a replacement to using CCleaner and other types of cleaners for clearing out cookies, while it does clear out cookies, there is no easy way to "White list" the cookies that you want to keep. I do realize you can right click over in my case Google Chrome in the scan results section to see the list of files and uncheck what you want to exclude, but there is no clear definition as to what cookie is what, only numbers for identification making it impossible to white list the ones you want to keep. So it is delete all or nothing. An improvement would be a better cookie clarification to allow an easier way to exclude the ones you want to keep. 2nd - I use One Drive all the time, I ran analyze and opened the startup manager after doing so and it recommended to disable One Drive and classified it as "Useless". The thing is, it is not useless for me, I use it all the time, in fact it is essential for my uses. The problem is, it should be made more clear as to how to "White List" startup items. Most people when the startup item is unchecked and listed as recommended to disable will re-check the item and select "Apply" thinking that it will exclude the item or items, but it does not. You have to "Right Click" and select "Ignore" for each item that is set to be disabled to exclude them. This is very confusing and I hope the author changes this in future versions to avoid this confusion. 3rd - As mentioned previously, the point of having check boxes is to not have to right click. I think there should be a better design to where everything is right there in front of you instead of having to right click. The check option also having the right click extra options for certain items makes things very confusing and most certainly will result if you aren't careful in disabling or deleting something you do not wish to do so to while leaving you thinking that it is excluded. 4th - I really like the Tune Up section of the software, it is very straight forward and has some useful tune ups. Only issue for me is, I think it would be better left in the toolbox section and ran on a "Per needed Basis" rather than having it in one click maintenance. The reason why is I could find no way to exclude some tune ups that I wish to not use "If it is ran using the one click maintenance method". I realize you can unclick it in the one maintenance settings, and you can also select "Default" if you accidentally disable something or uncheck it etc... It could cause an issue if you forget or are unaware that you just ran something you did not mean to. Otherwise, some very nice tweaks in there. 5th - The Spyware Defender section appears to be very good, and also has an easy to exclude section with explanation on how to do so. I really like this, very good! 6th - Registry Cleaning section - While I generally try and avoid registry cleaners, this looks very nice and tells you what you are about to remove, it's easy to exclude items by right clicking, but there again, if you uncheck something it leaves the user with the impression that it will be white listed when it is not, so unless you specifically right click and exclude something, unchecking it will not protect it next time you run registry cleaning, you have to right click to exclude. One last suggestion, it would be a nice addition if the author were to add the option to create shortcuts on your desktop to each item in the toolbox individually for those who just wish to use specific parts of the software. Overall, I am impressed with all the available options and tools, don't get me wrong, I am not complaining, I am giving my review to hopefully help the author better improve the software. I must ask though, since this is not a lifetime license and you get "No updates" per the read me file in the download file, I am assuming you can use it forever so long as you don't update it? Or does it revert to the free version after a period of time? Thanks again for the giveaway! Only thing i find funny this this boasting claim: "STOP Windows 10 spying with Privacy Guardian." Which is impossible to do because then you have to close down the entire Win 10 core and ecentially stopping Windows 10 from working. The backdoor and everything they do are hardcoded into the core of Windows shut anything from the Core down and Windows stop working so nice try. Only thing i find funny this this boasting claim: "STOP Windows 10 spying with Privacy Guardian." Which is impossible to do because then you have to close down the entire Win 10 core and ecentially stopping Windows 10 from working. The backdoor and everything they do are hardcoded into the core of Windows shut anything from the Core down and Windows stop working so nice try. Wipeout, Yes ! If you stop windows 10 from doing what it was designed to do eventually it will just stop running properly. If you don't like win 10 why do you run it. Wipeout, packet sniff the alleged spying endpoint IP numbers and then null route them in your routers advanced config, you could null route all the microsoft owned IP allocations associated with the currently used IP numbers in case it cycles through IP ranges over time. MG, I don't so thats a easy one. TK, Actually that would not work either they already fixed that in around third patch it was the data is send via random IP's true friends such as google and so on meaning to block it this way you pretty much has to well shut off your internet. MG, I don't so thats a easy one. TK, Actually that would not work either they already fixed that in around third patch it was the data is send via random IP's true friends such as google and so on meaning to block it this way you pretty much has to well shut off your internet. Wipeout, actually that would work as in routing tables you can easily block off each and every single address individually as well as whole IP blocks that are assigned to specific organisations, just because some internet pundit can't spot a pattern in the IP numbers used and has never figured out how to do a reverse IP lookup to discover who was assigned the IP and so declared they were using random IP numbers when in truth that is simply NOT possible the IP network cannot work that way even for operating system programmers! Your source was ill informed and probably had an agenda to paint Microsoft in the same brush as the world paints China internet sniffing and spying government. Of course you could do it the opposite way around and WHITELIST IP numbers and select IP blocks like find the IP numbers asigned to the web servers you ARE interested in contacting and route those correctly and leave the rest of the internet NULL routed. Here you should NOT whitelist whole IP blocks assigned to a large company like google or dropbox or amazon or cloudfront or other large cloud provider as Microsoft or ANY other company can contract services from them to collect data via them... So NO Microsoft do not use Random IP numbers to collect tracking data with that is FAKE NEWS! To the uneducated and uninformed that just see a list of IP numbers and do not do the research they may be seemingly random... but then again to the discoverers of DNA the molecules seemed to be a random selection of molecules assigned to each organisim until they did sufficient research and learnt that it is not random at all but a collection of building blocks that can be combined in many ways to form biological machnes much like object orientated programming designed by humans. Actually Microsoft build the core to realise if there is Internet access if there is do i get response from well the right servers ohh i do not = blocked = cause problems. Shut down them all so it gets no response at all and it would be the same as closing down its cores. To avoid this it need full no Internet access they have been smart, but they have so many backups that your chances of actually blocking is pretty much non existing as they even work with google and a few DNS services so. And for my sources yeh well they are my own test using Virtual Machines to find out if the rumors where true I found more than just the spy ware problem with windows 10. TK, Actually Microsoft build the core to realise if there is Internet access if there is do i get response from well the right servers ohh i do not = blocked = cause problems. Shut down them all so it gets no response at all and it would be the same as closing down its cores. To avoid this it need full no Internet access they have been smart, but they have so many backups that your chances of actually blocking is pretty much non existing as they even work with google and a few DNS services so. And for my sources yeh well they are my own test using Virtual Machines to find out if the rumors where true I found more than just the spy ware problem with windows 10. Come'on, it's old Synei Utilities. Nothing more, nothing new. I have tried many other system cleaners, Kerish Doctor, System Mechanic, Advanced System care, to name a few. Many were bloatware. Pegasun System Utilities is one of the few that are not loaded with useless stuff or trying to sell you products or services. It works very well in cleaning the registry, finding junk files, giving me recommendations to system services just to name a few useful tools. I highly recommend this over the others. I guess Pegasun is the only 64bit PC tuner on the market. I'm usually very skeptical of the claims made by software such as this but decided to give it try and see for myself. First off, download and installation was very quick and easy, no jumping through hoops today. Nice clean, uncluttered UGI which I thought looked very similar to Iobit's Advanced System Cleaner. I ran the program and set up some of the more advances settings, only do this if you know what your doing, and tested out the all the options. Everything ran smoothly and quickly and it even cured a little issue I was having with file explorer on Win 10, it took several seconds to open once clicked on and all my efforts to resolve this failed, making it frustrating to use, now it opens instantly. This is certainly worth having a look at. Thank you Pegasun and GOTD. Nice to have some good useful software for a change. it just great .from john and thise is my first comment . Ensure that in future the program installs without the need to disable Anti-virus software. I almost never install programs that ask or need me to do this. If I do disable Anti-virus software, I always spend considerable time running extra scans after the install to ensure that nothing has sneaked in. If I were the last man on the planet this would be with me, It’s features are just out of this world, no wonder it’s named Pegasun it’s the best under the sun. well don't read any one mine......I sure won't win........if I even wanted to. Carlos, 24 well don't read any one mine......I sure won't win........if I even wanted to. Intriguingly, the software is successfully activated (or so the opened browser window tells me) but doesn't actually get installed. Steve, don' t run in Admin mode. Cancel antivirus before install and after activate it again. Try both. Dear GOTD, Dear Pegasun Team :TRANK YOU VERY MUCH for sharing this software. In my specific case it simply made a miracle! My LENOVO YOGA 300 ( not too high quality machine ) after almost 3 years of its use seems to be perfectly „refreshed”. My OS was upgraded from Win 8 to Win 10 some time ago ( probably more than 12 months ago ) and Since that time I face many problems with reduced speed – not only BOOT time but also activation of programs etc. With each update of the OS it was getting worse…. To solve my issues I have already tried many tools similar to Pegasun ( some of them downloaded thanks to courtesy of GOTD ) but this is the first time when I really see the Real improvement. There is no big improvement on BOOT time but the other aspects seem to be improved a lot. 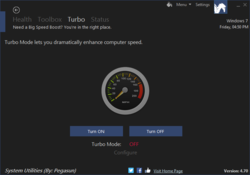 After performing the one key optimization and activating Turbo Mode my Applications start almost twice faster and whatever I do seems to run smoother. This is the first time when I deided to share my opinion/comments because the other tested tools similar to this one have never performer so well. In fact some of them even slowed my OS down. Registry clearing tool fund many more problems comparing to competitive software. Before activating the cleaning process I always recommend creating System Restore Point. 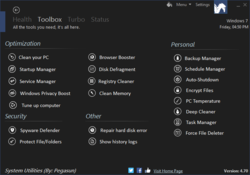 In case of Pegasun it is possibile using Task Menu – great option for those who are not familiar with tools built in OS system. The only way to make computers that have had Service packs/feature updates and multiple years worth of security updates work as well as 3rd party programs with services running is to strip back all those service packs/feature updates and 3rd party programs and their respective services. You simply cannot have it both ways! All the Microsoft patches and updates add complexity to the operating system and 3rd party services and scheduled jobs all require additional resources and while your PC was fine and suitably spec'd when you bought it, now it is over burdened and in need of more CPU resources and faster drives and more RAM to be able to perform the same as it did when it was fresh out of the box! Either you grow your machines specification as you grow yours and your operating systems demands upon it or put up with a sluggish machine whose performance you both rapidly got used to and bored with and then slowly but surely slowed down in real terms as you added more and more complex software including feature updates and service packs. The only way to make computers that have had Service packs/feature updates and multiple years worth of security updates work as well as 3rd party programs with services running is to strip back all those service packs/feature updates and 3rd party programs and their respective services. You simply cannot have it both ways! All the Microsoft patches and updates add complexity to the operating system and 3rd party services and scheduled jobs all require additional resources and while your PC was fine and suitably spec'd when you bought it, now it is over burdened and in need of more CPU resources and faster drives and more RAM to be able to perform the same as it did when it was fresh out of the box! Either you grow your machines specification as you grow yours and your operating systems demands upon it or put up with a sluggish machine whose performance you both rapidly got used to and bored with and then slowly but surely slowed down in real terms as you added more and more complex software including feature updates and service packs. Orson, the "bribery" is always for helpful ideas to improve the product. You don't have to say you like it. Duh. M. Aronson, I think you do have to say you like it... Imagine if you tried it, hated it and gave some really great suggestion but ended on I wouldn't want this garbage on my system even if they implimented my wonderful idea! Do you think they'd annoy you further by trying to push a lifetime license on you or just shrug and use your idea and give the lifetime license to someone that actually wants it and puts a glowing product review comment on here! Also re-read the statement it does say the best 3 comments NOT the best 3 ideas for improvement! M. Aronson, I think you do have to say you like it... Imagine if you tried it, hated it and gave some really great suggestion but ended on I wouldn't want this garbage on my system even if they implimented my wonderful idea! Do you think they'd annoy you further by trying to push a lifetime license on you or just shrug and use your idea and give the lifetime license to someone that actually wants it and puts a glowing product review comment on here! Also re-read the statement it does say the best 3 comments NOT the best 3 ideas for improvement! Thank you very much for the program, the computer performance has improved, and a good cleaning program, I can recommend it to everyone. FIRST OFF, I want to say that it's nice that they included the warning about antivirus software may affect installation. No other software I've used has done that. I LOVE that. Next, the software itself is nifty. I was running into so many problems just yesterday with trying to play videos, download software, I called my ISP and complained. Good thing I make it a habbit to check this website daily, because this lovely program saved my sanity and my computer. 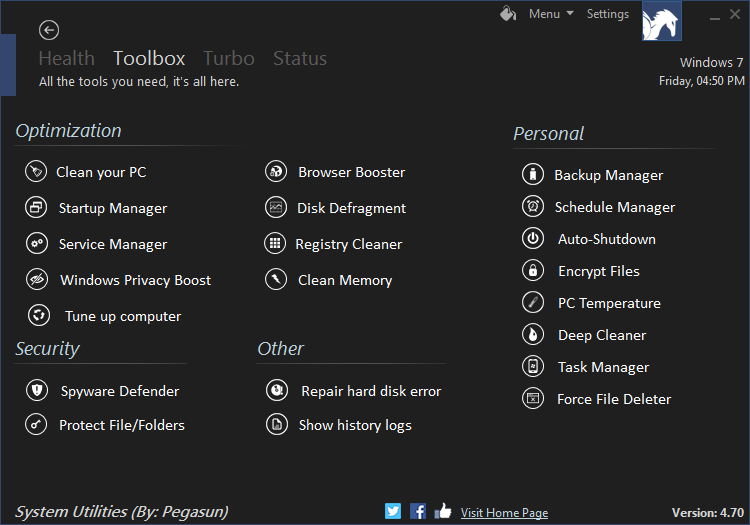 There were so many problems affecting my laptop and Pegasun saved it! On top of everything it gave me back just a little over 8GB from clearing just junk files! That may not sound like much with my 1TB HDD but it REALLY helped. It also located a FAKE Chromium VIRUS, and removed it for me. Plus the best part of all it allowed me to get wid of those bloatware Metro apps that have been there since I got this computer. I am still trying to learn everything this program can do, because it seems to do EVERYTHING I needed. FIRST OFF, I want to say that it's nice that they included the warning about antivirus software may affect installation. No other software I've used has done that. I LOVE that. Next, the software itself is nifty. I was running into so many problems just yesterday with trying to play videos, download software, I called my ISP and complained. Good thing I make it a habbit to check this website daily, because this lovely program saved my sanity and my computer. There were so many problems affecting my laptop and Pegasun saved it! On top of everything it gave me back just a little over 8GB from clearing just junk files! That may not sound like much with my 1TB HDD but it REALLY helped. It also located a FAKE Chromium VIRUS, and removed it for me. Plus the best part of all it allowed me to get wid of those bloatware Metro apps that have been there since I got this computer. I am still trying to learn everything this program can do, because it seems to do EVERYTHING I needed. awesome! i used many cleaner but not satisfied. 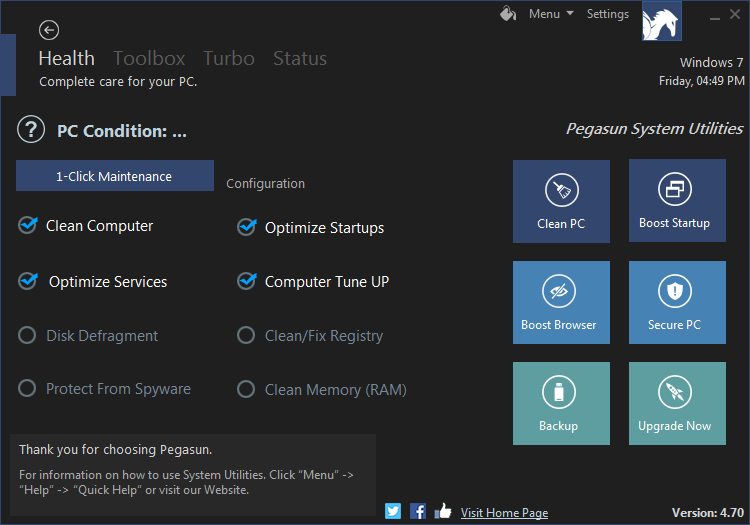 now i use pegasun system utilities its best my pc run like new pc .believe me try it once you sure satisfied.thanks pegasun!